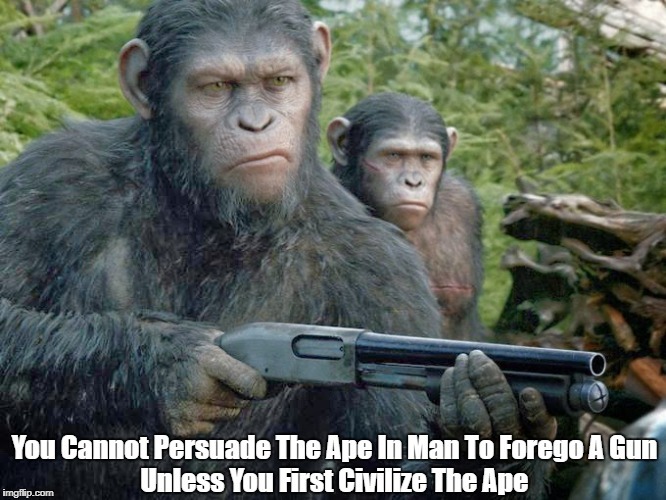 Being defenseless isn't the same as being civilized. Neither I -- nor anyone I know -- advocates "being defenseless." "Being defenseless" is your fear, not my political reality. Citing the opening words of The Second Amendment, I do advocate a "well-regulated militia." To support a "well-regulated militia" is civilized. Alternatively, "more guns, fewer laws" is uncivilized. Why do you think the words "well regulated" are included in the opening phrase of The Second Amendment? In an amendment that contains only 27 words, why are two of those words "well regulated?" "What Second Amendment Evangelists Fail To Understand About Their Opposition"
"Gun Cartoons and Gun Violence Bibliography"
Mom Killed By 2 Year Old Child Described As "Responsible." NOT! 80% Of All Firearm Deaths In 23 Industrialized Countries Occurred In The U.S. The militia and the right for citizens to bear arms are two separate points, just like freedom of speech and freedom of religion are two separate points of the same article. I'm assuming you know that a militia is not the same as a military. Here's my question to you, and then I'll answer yours. How is a militia supposed to be maintained if it's been forced to forgo its guns? "Well regulated" was put in place so the militia wouldn't turn into a group of pirates acting without the country's best interests in mind. Given that there are practically no civilian militias I'd say they've been over regulated and frowned upon by "civilized" people. Also, why do you need so many sources to tell you what to think? Can't you just read the constitution and make your own opinions? Man, you really can't read.